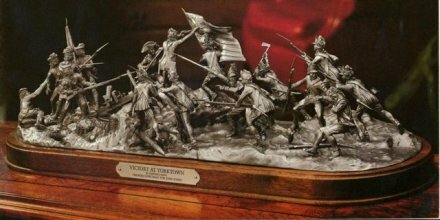 �Victory at Yorktown� is modeled in pewter by Sheperd Paine for the Franklin Mint in 1981 to commemorate the 200th anniversary of the final battle of the American Revolutionary War. This three dimensional diorama consisting of 17 individually casted action figures (1:20 scale) depicts the charge of Col. Alexander Hamilton and his men as they storm the British held defensive position at Redoubt 10. A limited edition offering restricted to only 750 and measuring 24 inches long, 7 inches high, and 9 inches wide mounted on a solid mahogany wood plinth. The piece offered here is #129 and is in perfect condition. Price is the original issue price more than two decades ago and does not include shipping costs.